Herbert Ferber (1906 –1991) was an American sculptor and painter, born in New York City. He began his independent artistic studies in New York in 1926 at evening classes at the Beaux-Arts Institute of Design, while attending Columbia University Dental School. In 1930, he attended the National Academy of Design, and that summer he was awarded a scholarship to work at The Louis Comfort Tiffany Foundation in Oyster Bay, New York. He also began part-time work as a dentist. Impressed by African sculpture, he purchased his first piece of African art in 1931. 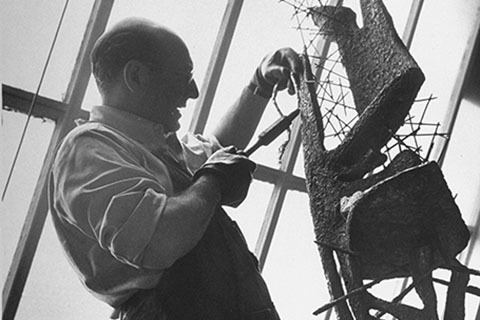 Ferber received his dentistry degree in 1930, and, until the 1950s, he maintained two careers, as Abstract expressionist sculptor and dentist. Ferber's best-known sculptures are open, hollow forms in soldered and welded metal. While abstract, their titles and spiky forms often suggest forces in conflict. ('Labors of Hercules' is an example). By the mid-1950s, he began to create, what he called, roofed sculptures―some parts of which hung from the ceiling while other parts rose from the floor. These were followed by so-called cage works―large, boxy forms within which other forms were set. With Sculpture as Environment exhibition (1961), Ferber created an installation executed in fiberglass for a room at the Whitney Museum of American Art in New York City, opening up the interior space of the work for the viewer to enter. In the 1970s, Ferber continued his exploration of abstract form, mostly in large-scale outdoor pieces. Herbert Ferber: Space in Tension showcases his direct-metal constructions and Minimalist paintings, including works in a range of media never exhibited before.